When I got back to the house today I found the flock of turkeys making themselves at home. They were bedded down in the field between the house and the lake, and they sat on lawn furniture up near the house. When I went out to water the containers these turkeys gathered closer, hoping that I had something other than water. I laughed at them, and shooed them away. Minutes later the grackles arrived. Every fall these black birds pass through Cape Cod, and I think of them as Rice Crispy birds because they snap, crackly and pop. They were kind of scary the first year I lived on Cape, because they arrived by the hundreds and noisily took over the neighborhood. I now know that the grackles are only around for a week or two in the winter as they make their way south, and I cheerfully greet them and am equally glad when they go on their way. One of the best side benefits of gardening is being in touch with all of the wildlife that shares our landscapes. From the many varieties of bees and wasps to the birds and yes, even the rabbits. All remind us of how we are connected to the seasons and the earth. 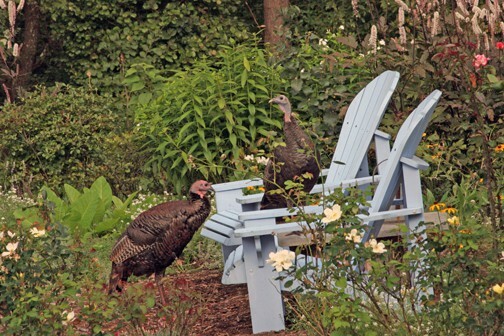 For better or worse, the turkeys are making themselves at home. 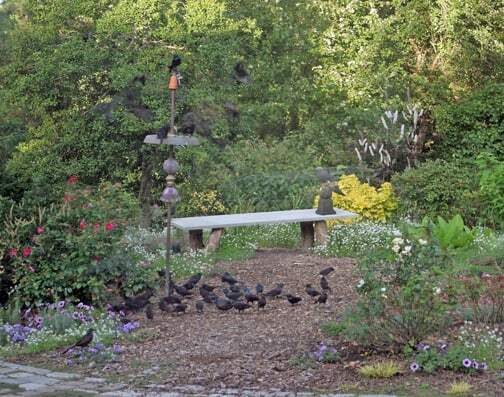 The grackles gather by the hundreds and when I go outside I hear them snap, crackle and pop . This is the sound of fall on the Cape, and I say to them, "Welcome, and safe travels as you move south."